Description of "Makhmali Dadhi (Hindi)"
Ishq/Romance has been served differently. Most of the quotes written in liberal Mode seem to be touching the present mood. Arpita, a resident of Rajasthan's capital Jaipur, is a businesswoman. In the name of Giftwala, her company is working in the field of Corporate Branding. She was inclined in the field of art since her school days and has participated many times in school poetry events meet. In the early days, she had been a part many of big poetry conventions and also received accolades from the Rajasthan Pathak Forum. In her writing, she tries to express/capture all the human moods, but her writing is more inclined towards Romance. Raahat Indori, John Eliya, Vishal Bhardwaj, and many other names can be added to her favorite poet's list, but Gulzar Sahib has been her Idol. 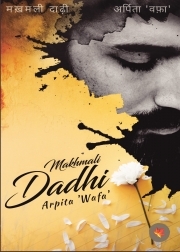 Reviews of "Makhmali Dadhi (Hindi)"